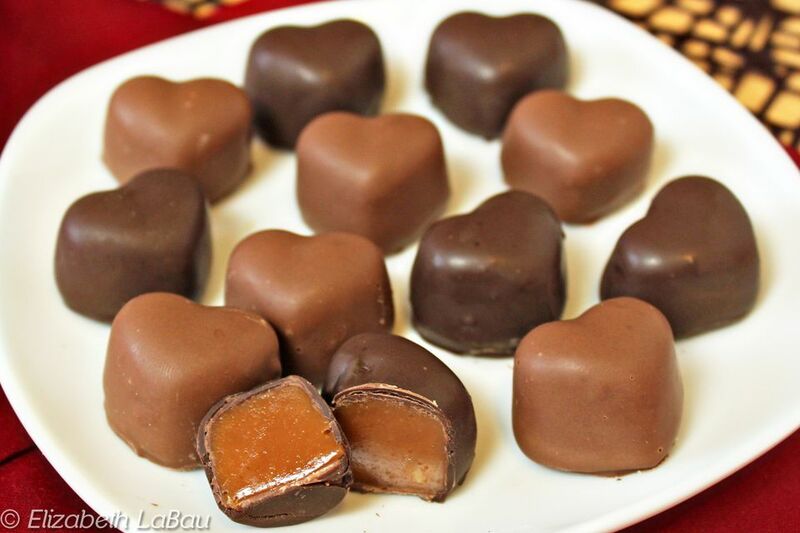 Caramel Hearts are luscious heart-shaped caramels dipped in chocolate. These homemade Valentine's Day candies are a beautiful, delicious alternative to traditional truffles. You can use store-bought caramels for this recipe, or make a batch of homemade caramels using any of these caramel recipes. Leave them plain, or sprinkle the tops with chopped nuts, sea salt, cocoa nibs, or even gold leaf! Make sure your heart-shaped silicone molds are clean and completely dry. If you are using store-bought caramels, unwrap them all first. Place the caramels in a medium microwave-safe bowl. The texture of the caramels now will be the texture of the finished Caramel Hearts, so if the caramels are very firm and you would like a softer caramel, add a tablespoon or two of cream to the bowl. If you are happy with the texture, the cream can be omitted. Microwave the caramels in 30-second increments, stirring after every 30 seconds. Continue to heat and stir the caramels until the mixture is smooth and fluid. Use a spoon to fill the cavities in the mold. When all the caramel is used, let the caramel cool to room temperature, then refrigerate the molds until the caramel is very firm. When the candy is very firm, turn the mold upside-down and gently press the back of the hearts to push out the caramels and release the candies. Melt the chocolate candy coating or temper the chocolate. Using dipping tools, dip each caramel heart in the melted chocolate until it's completely coated, and place the dipped caramel on a piece of parchment or waxed paper. Repeat until all of the caramels are dipped. This recipe requires silicone heart-shaped molds, which can be found in gourmet kitchen shops or many online stores. Silicone ice cube trays, which are cheaper and often more readily available, will also work for molding the candies. Regular candy molds will not work because the molds need to be flexible so that the candy can be pushed out from the back. Store Caramel Hearts in an airtight container at room temperature for up to two weeks, or in the refrigerator for up to a month. For the best taste and texture, bring them to room temperature before serving.